Roses are beautiful on their own. But pair them with a plant that complements their form or texture, or that blooms during your rose's downtime, will make your garden even more dramatic. Here is a list of plants with similar growing conditions to roses, that will make great companions for your rose plants. The tall, spiky flowers of anise hyssop contrast nicely with the cup shape of roses. 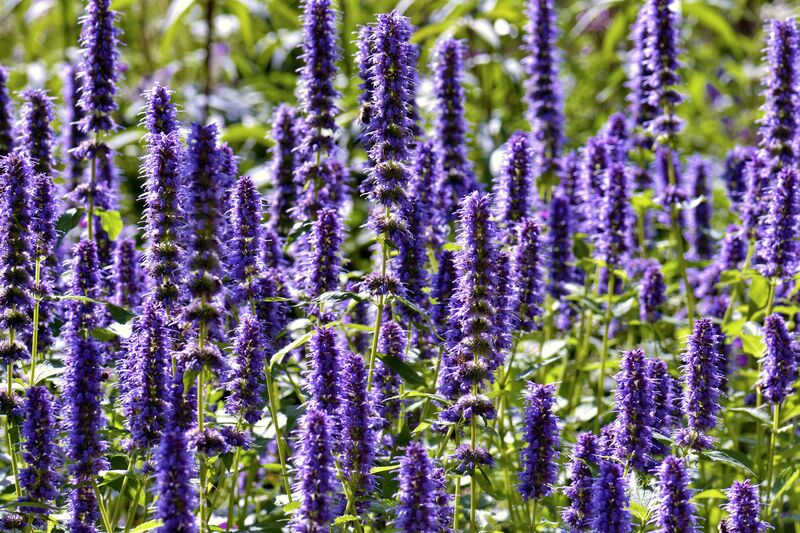 Hyssop comes in many colors besides blue and there's sure to be one that complements your roses. Whether you choose a tall flowering bellflower or one that spreads along the ground, most flower repeatedly throughout the summer, filling in the lull when your roses are taking a break. Catmint is a classic with roses. The abundant sprays of blue flowers engulf the rose flowers and hide their ugly "knees". Cut your catmint back after flowering and it will bloom again and again. Baptisia is one of the most beautiful blue flowers you can grow and one of the few flowers that might just upstage your roses. They bloom only once per season, but for a long time. And once the flowers are gone, you still have that gorgeous blue-green, pea-like foliage and fascinating seed pods, that rattle as they dry. Phlox is an old-fashioned flower that has greatly improved over time. New varieties are far less prone to powdery mildew. The tall flowers form dense clumps that will encase your roses in lush foliage. You couldn't get more contrast to roses that the thistle -blossoms of Echinops. Their steely blue color works especially well with pinks, corals, and yellows. Hardy geraniums have long been the first choice for planting under roses. These low growers make themselves at home and form a living mulch, protecting the rose roots and complementing the flowers with their shades of white, pink, and blue. This underused herb forms a dense carpet that will help you greatly cut down on weeding. The leaves are thick and remain attractive long after the pink flowers have faded. Germander blooms early in the season when roses are just waking up. Lady's Mantle evokes English flower borders. You always see it spilling over pathways, with its chartreuse flowers languorously bending toward the ground. It can bring the same charm when planted under roses. If you love scented flowers, you will be in heaven with a lavender and rose combination. Try and choose colors that blend with one another. The paler lavenders look wonderful with both pastel roses and deep reds. For another scent treat, tuck some lily bulbs in your rose border and enjoy how the bold, nodding flowers contrast with the sprays of roses. Lilies tend to start blooming about the same time as roses, so you will get both fragrance and visual pleasure. Salvias are some of the most dependable and adaptable garden plants. Their spiky flowers will start blooming just before your roses and continue on for weeks. Be sure to deadhead, so you will get repeat blooms. The larger alliums, like 'Purple Sensation', tend to bloom in mid-spring, while your roses are just sending up new growth. Choose multiple varieties that bloom at different times and you will have a long season of color. Even when they are finished flowering, the round seedheads make a great foil for delicate roses. Russian sage is a large, billowy plant with airy purple flowers that slowly reach their full, intense color in summer. They could easily engulf your roses, so be sure to allow some space between plants It's worth it to get the rich color combinations. Much like Echinops, sea holly makes a strong contrast with the elegance of roses. The cool, silver of sea holly's flowers has a cooling effect on bold rose colors and they are just tall enough to make a nice curtain for the bottoms of your rose plants. Euphorbia plants have foliage that looks good all season and flowers that stay in bloom for weeks. The blue-green leaves provide a nice backdrop for when your roses are in bloom. Wormwood provides season-long soft, silvery-gray, foliage that will make your roses stand out and sparkle. If you are looking for a low maintenance rose companion, this is it. If you are gardening in dry conditions, yarrow makes an excellent choice with roses. These undemanding plants thrive in full sun, as roses do, and they won't complain if your roses soak up all the water. If you like to change things up every year, annual plants are the way to go. Annual phlox is low growing and blooms almost non-stop. Four O'Clocks live up to their name, flowering in the late afternoon and throughout the evening. If this is when you are home to enjoy your garden, they will deliver quite a show. A large mass planting of Heliotrope is like a whiff of vanilla in your garden. Can you imagine the combination of rose and vanilla? For non-stop color, even when your roses are between blooms, Lantana is a great choice. It comes in a wide variety of colors and heights. It can be perennial in warm areas, but you can usually find smaller plants to use around your roses. Larkspur can start blooming in the cool days of spring. If you are impatient waiting for your roses to take off, you can console yourself with delicate larkspur, until the roses catch up. Is there anywhere Million Bells doesn't work well. These tiny cousins of petunias bloom non-stop and the choice of colors will dress up any shade of rose. Pansies are for the gardener who wants to see color as early in spring as possible. They will slow down in the heat of summer, but their foliage should remain as a nice carpeting for roses. If kept watered, your pansies will resume blooming in the fall, when the roses close down. The dramatic, iridescent leaves of Persian shield make a bold statement in the garden. You might not want to pair them with your deepest red roses, but with pastels, especially peach, this is a striking combination. The soft colors of Angelonia flowers pair well with just about any rose, allowing the more saturated rose colors to stand out and shine. Nicotiana, especially the tall Nicotiana sylvestries, with its dangling white, tubular flowers, makes a very dramatic pairing with any color rose. The gray foliage of caryopteris shrubs will beautifully offset any color rose. Once the blue flowers bloom in late summer, the contrast is eye-catching. For a timeless classic, boxwood and roses can't be beaten. You could create a border or simply offset the casual nature of the rose bush with a clipped box specimen. With there small growth habit, delicate, scented flowers and subsequent berries, Daphne is an all season plant that will complement roses whether in bloom or not. Spirea shrubs are almost maintenance free and they look good all season. The foliage often starts out reddish and develops into either bright green or yellow. Whether you go with a pink or white flowering spirea, its mounding habit will tame the wildness of any rose bush.